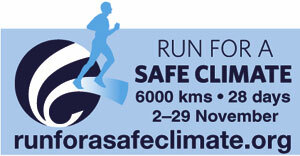 Follow SMPC Director Andrew Kantor as he takes part in the Run for a Safe Climate charity event to raise awareness of global warming. 30 Australian emergency service crew will run 6000 kilometresfrom Cooktown, through The Daintree, The Great Barrier Reef, Alpine areas of NSW, along the Murray to Adelaide and along the Great Ocean Road, eventually ending up in Melbourne, hoping to raise awareness of the global warming crisis by linking some of Australia’s great natural icons that are at risk. Andrew is donating his Physiotherapy services to the team as well as running in the event himself. Be a part of it and donate at www.runforasafeclimate.org/donate-to-the-runor you can come in and donate at the clinic. A massive thanks is extended to those of you who have already kindly donated. It is greatly appreciated! Liveupdates of Andrew and the team’s progress along with any news during the event will be on our Twitter page and Facebook.